The Global Search for Education: Champions! Champions! Champions! They are world famous Olympic and Paralympic Champions, including Meryl Davis and Charlie White, Sue Bird, Elana Meyers, Josh Sweeney, Curt Tomasevicz, David Oliver, April Holmes and Erin Hamlin. 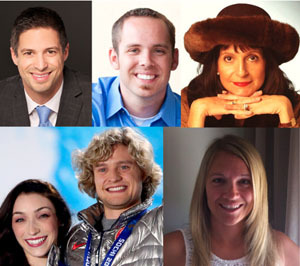 They are led by 2010 Olympic bobsled gold medalist Steve Mesler and Dr. Leigh Mesler Parise. 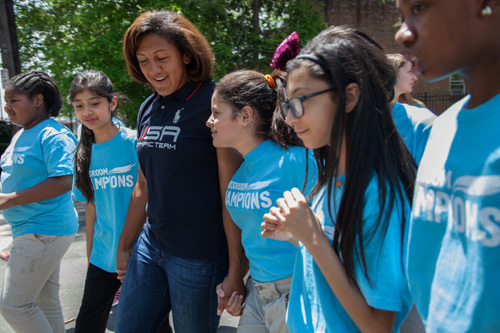 They are the first and only in-school program to connect athletic champions with students in high-need schools on an ongoing basis. They build strong relationships and inspire students to believe, to persevere and to always dream BIG. Does the concept give you goose bumps? 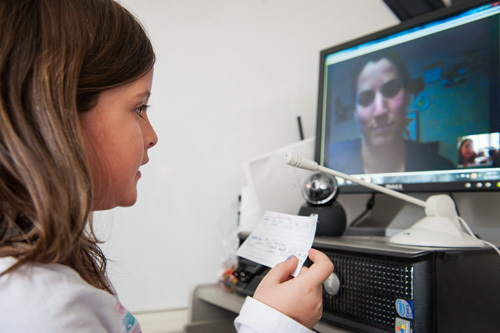 Classroom Champions was recently announced as a winner of Google's Giving Through Glass competition. If you don't know what this awesome Google initiative is all about, I suggest you Google it fast! What can Classroom Champions teach us about mentoring? Today in the Global Search for Education, I have invited 4 Champions from the world of sports and our classrooms to reveal their 12 Lessons From The Champions of Classroom Champions. It is my pleasure to welcome the 2010 Olympic Gold Medalist for Bobsled and Founder of Classroom Champions, Steve Mesler; Olympic Gold and Silver Medalist, Ice Dancing and the 2014 Dancing with the Stars Champion, Meryl Davis; Grade 8 teacher at St Joseph Catholic School in Ontario, Jenn Nalon; and School Principal from Waller, Texas, Todd Nesloney. Meryl Davis, warm us up! 1. Get personal and make a difference. When speaking with students, it's easy to preach ideas and ideals: have a goal, work hard, and never give up. Pointing a child in the "right direction" isn't always enough to manifest true interest. My ice-dancing partner, Charlie White, and I have found that telling our personal stories and sharing our own struggles seem to generate more positive responses from our students. We love getting emails from our teachers about how a child was positively impacted by hearing our stories. Furthermore, we've been told that sharing our challenges increases tolerance and acceptance within the classroom towards students who may be facing similar problems. Over the course of our two school years with Classroom Champions, Charlie and I have realized how our roles so drastically differ from that of a teacher. When we began creating videos and speaking with our students, I think we felt as though we were stepping into these classrooms to actually teach a lesson each month. As time went on, however, we realized that our students saw us more as friends than teachers. The beauty of this dynamic is that our students can relate to us and allow us to lead by example. Our teachers will often tell us that their students talk about us, "Meryl and Charlie," as friends; it's as if we are present in their everyday lives. What an incredible opportunity this relationship gives us to reach these kids and, at the same time, gives our teachers an opportunity to use us as a learning tool. Each school year, we dedicate a video lesson to "community". We focus on the importance of community and the role our students can play in their communities. The classroom itself, as we say, is an important and relevant "community" for our students. Being kind, supporting others and asking for help when needed, for example, are ideals that can be difficult to integrate into these classrooms. Having monthly video lessons to share and mutual "friends" in the athlete mentors seems to encourage additional camaraderie and a sense of community within the classroom. Jenn Nalon, keep us moving! 4. It takes a village to raise a child. And the child is proud and thankful for every member of his/her village. In the program, students are encouraged and cheered on by their teacher, community, athlete mentor, Steve (Mesler) and all members of the CC team, not to mention the entire CC teacher team via our Ning site. Our students are flourishing as they take great pride in sharing their success with our entire team and have been invited to continue sharing with their athlete mentor, as they enter high school. We celebrate DREAMing BIG! 5. Network with people who share the same passion. The amount I learn from my CC friends far exceeds what I ever thought was possible in an online forum setting. My desire to learn with and from my CC peers, who come from different geographical regions, provinces, states and countries with various mandates, is a daily occurrence. We also take pride in each other and keep contact across North America via Twitter, Instagram, Facebook and Ning. Our shared passion keeps learning alive in an electrifying way. Our village has grown but our need to be in contact is evident too. We can't wait until we get together again next year when the fire within strengthens. 6. Relationships and goal setting are the keys to every success. I have learned through student success that these two qualities are key to each day. We have built so many valuable relationships and expressed our concern and excitement for each other's success. The relationships strengthen and the goals get larger. Todd Nesloney, go for it! I don't think I ever truly grasped the concept of that word, perseverance, before taking part in Classroom Champions. My students had Paralympic athlete Joshua Sweeney as our athlete. There are very few people in my life that I now admire as much as Josh. Lessons that he was able to express to my students through the trials he has been through are irreplaceable. There were several times through our Classroom Champions lessons where I had kids in tears because they were so emotionally moved. Classroom Champions taught me, and my students, about the power that lies in believing in yourself and believing that no matter where you come from you can be successful and you can make a difference with goals, hard work, and determination. When Josh visited our school and spoke to the 700 pre-K to 5th graders, you could have heard a pin drop. He shared his life story and spoke to each of those kids' hearts. Every child left that day feeling like they mattered. Even though my students learned through recorded videos of Josh, every student felt like he had made the video especially for them. They connected to him, bonded with him, and learned so much. When we did our Google Hangout with Josh, my kids were just enamored and had a million questions for him. 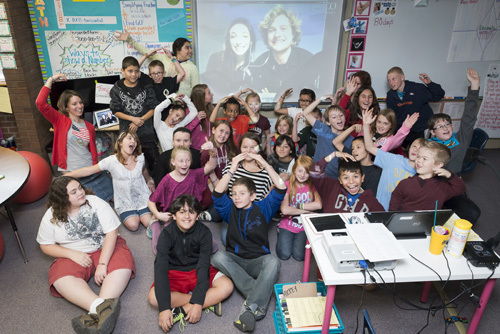 My students, in a tiny town in Texas, were able to connect with, and learn from, an Olympic athlete because of the power of technology. Steve Mesler, bring home the Gold! 10. A question is the most powerful weapon we all possess. Whether you're trying to understand someone's point of view, trying to figure out a complex problem, or wanting someone to volunteer for an initiative, the single greatest weapon you have in your arsenal is a question. As we've built Classroom Champions into the international NGO it's become, I've learned that if you don't ask questions, you'll never succeed. I've learned that, in general, people want to help; they want to answer questions - it's how we're built. Remember that and you can accomplish more than you think. 11. Relationships make the world go round. The first thing we do at Classroom Champions is look to foster a relationship between Olympian and student. If kids feel connected to their athlete, if they feel like they can depend on them, they begin to trust them and good things happen. In building relationships, you have to remember to be consistent in your words and your actions. 12. Crack the volunteering code and change the world. People are busy these days. Olympians, Paralympians, and teachers are just as busy and overwhelmed as the rest of the world. How do you engage busy people to volunteer to make a difference? It's the same as paying someone with cash - reward their effort with compensation. The only difference? Compensate them with the ability to see their impact with quality metrics, compensate them with strong relationships, and compensate them with feedback that will make them better at the things they care about. All photos are courtesy of Classroom Champions. Join me and globally renowned thought leaders including Sir Michael Barber (UK), Dr. Michael Block (U.S.), Dr. Leon Botstein (U.S.), Professor Clay Christensen (U.S.), Dr. Linda Darling-Hammond (U.S.), Dr. MadhavChavan (India), Professor Michael Fullan (Canada), Professor Howard Gardner (U.S.), Professor Andy Hargreaves (U.S.), Professor Yvonne Hellman (The Netherlands), Professor Kristin Helstad (Norway), Jean Hendrickson (U.S.), Professor Rose Hipkins (New Zealand), Professor Cornelia Hoogland (Canada), Honourable Jeff Johnson (Canada), Mme. Chantal Kaufmann (Belgium), Dr. EijaKauppinen (Finland), State Secretary TapioKosunen (Finland), Professor Dominique Lafontaine (Belgium), Professor Hugh Lauder (UK), Professor Ben Levin (Canada), Lord Ken Macdonald (UK), Professor Barry McGaw (Australia), Shiv Nadar (India), Professor R. Natarajan (India), Dr. Pak Tee Ng (Singapore), Dr. Denise Pope (US), Sridhar Rajagopalan (India), Dr. Diane Ravitch (U.S.), Richard Wilson Riley (U.S.), Sir Ken Robinson (UK), Professor PasiSahlberg (Finland), Professor Manabu Sato (Japan), Andreas Schleicher (PISA, OECD), Dr. Anthony Seldon (UK), Dr. David Shaffer (U.S.), Dr. Kirsten Sivesind (Norway), Chancellor Stephen Spahn (U.S.), Yves Theze (LyceeFrancais U.S.), Professor Charles Ungerleider (Canada), Professor Tony Wagner (U.S.), Sir David Watson (UK), Professor Dylan Wiliam (UK), Dr. Mark Wormald (UK), Professor Theo Wubbels (The Netherlands), Professor Michael Young (UK), and Professor Minxuan Zhang (China) as they explore the big picture education questions that all nations face today.